Why would Nokia put a Qualcomm processor in the phone if they were making the OS for it with Intel....? specification are awesome if as it is it will be announced it will b a superb cell phone having good features if the camera will be upgraded it will be rocking. I hope this phone is for real. Nokia please put in FM transmiter like N8 and C7. Arkkimeedees, 09 Oct 2010N9 should something totally great: 1,6 GHz processor,5 inch display including 3D properties, c... moreI totally agree vit u. Dey also hv 2 make the ram more dan 1.5gb and d rom more dan 2gb. den it will be perfect. Arkkimeedees, 09 Oct 2010N9 should something totally great: 1,6 GHz processor,5 inch display including 3D properties, c... moreMan,5inch is oversize for cellphone but also to small for tablet pc. I think best size is 3.7inch minimal and 4inch is maximal for touchscreen phone. But 3.5inch is also enough for me,except if you are very big guy with big finger. [deleted post]There is more to designing a phone than just taking the best components and putting it all together. You have to take cost, space, power, market segment, etc. into consideration. Different phones have different advantages because designers have to balance so many things. Also, different users have different needs and not everyone will want to pay a premium to pay for something more than what they need. Nokia pls improve and the ram and rom. By d time you hv released this phone the specifications will be outdated and old, the samsung galaxy has a extrmely good rom which is 2gb,ram of 512mb and the galaxy has been released in june. Most importantly pls change the screen, dont use tft, the Samsung S8530 Wave II is using a Super Clear LCD capacitive touchscreen, pls try and create somethin better. Also improve the camera to about 12mp and CPU speed. Pls try not to concentrate on the price and start concentrating on the quality and development. Release dis phone as soon as possible with d upgrades. So far samsung is way ahead in technology so try 2 make d n9 better dan d samsung. 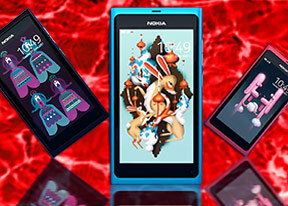 Nokia please, do something with the design its look ugly. and please make it slim,and also change some spec and make it better than n900. Anonymous, 07 Oct 2010I don't know why, but I expected 1280x720 display resolution. :DI think people get some emotional high when they see higher specs. Whether it is memory, processor speed, resolution or anything, having that better number just makes the device appeal more. I think that ultimately, you have to actually try it out to get a good feel for the phone. Until we actually get our hands on one, all we can go buy are specs in a vacuum where the better numbers rule.